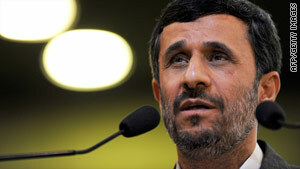 Iranian President Mahmoud Ahmadinejad is in the midst of a three-nation tour of South America. (CNN) -- Iranian President Mahmoud Ahmadinejad continued his three-nation tour of Latin America on Tuesday, signing accords with Bolivian President Evo Morales and pledging mutual cooperation. Morales met Ahmadinejad at the airport in La Paz, Bolivia's capital, where the controversial Iranian leader received a bouquet of roses from a young girl and military honors from the Presidential Red Battalion. The two leaders then retired to the government palace, where they met privately. A large crowd gathered in the central Plaza Murillo, some of them holding up signs with Ahmadinejad's photograph. Among the day's activities were the inauguration of three industrial facilities built with Iranian financing. Ahmadinejad traveled from Brazil, where he met with President Luiz Inacio Lula da Silva in Brazil on Monday. He left Bolivia on Tuesday afternoon for Venezuela to meet with leftist President Hugo Chavez, a strong ally. Ahmadinejad already visited Gambia, on the African continent, and will stop in Senegal on his way back to Iran. The Iranian president hopes to strengthen economic ties with the five countries. But, more significantly, he aims to bolster political ties with sympathetic governments as he tries to counter U.S. and European efforts to curtail Iran's nuclear ambitions. Morales and Chavez are strongly opposed to U.S. foreign policy, as is Ahmadinejad. Ahmadinejad also wants to improve Iran's image after the brutal repression of demonstrators who objected to the outcome of the presidential election in June. Ahmadinejad was re-elected, but many Iranians believe the election was rigged. Analysts don't see much significance to Ahmadinejad's visit to Bolivia, other than bolstering each country's politics against the United States. "The official agenda has nothing of substance," said Jaime Aparicio, the Bolivian ambassador to the United States from 2000 to 2006. "I don't give it much importance," said Rene Antonio Mayorga, a political scientist in La Paz. Ahmadinejad's visit to Bolivia really has to do more with Venezuela and its staunchly anti-American leader, the analysts say. "Much of this points to President Chavez," said Eduardo Gamarra, a Bolivian political science professor at Florida International University in Miami, Florida. "Since Evo Morales doesn't have independent politics, he is following in Chavez's path," Mayorga said. "This is a visit to demonstrate that Bolivia belongs to an anti-imperialist bloc and is opposed to U.S. foreign policy. More than that, I don't see it." Bolivia and the United States have had diminished relations since September 2008, when each country expelled the other's ambassador. Morales, a strong proponent of the cultivation of coca plants -- the source of cocaine -- expelled the U.S. Drug Enforcement Administration a month later. He also delivered a strong verbal criticism of the U.S. government at the United Nations General Assembly last year. Inviting Ahmadinejad is a way for Morales "to irritate the United States," said Aparicio, now a Washington-based analyst. "They think they don't need the United States," Aparicio said, noting that the power of U.S. aid to the nation has lessened. "They receive more money from Venezuela and Iran," the former ambassador said. "The traditional influence that the U.S. had in countries like Bolivia has diminished." Besides policy issues against the United States, Bolivia is interested in attracting investments from state-controlled economies such as Iran, Russia and China. "They want to improve state-to-state relations because they know private investment will be a problem," Aparicio said. Bolivia, one of the poorest and least developed countries in Latin America, has large reserves of natural gas and other hydrocarbons. Morales wants to tap into those resources, but he needs expertise and help. "Bolivians have interest in technology," said Gamarra, the FIU professor. "Iranians have interest in Bolivian minerals." With its burgeoning nuclear program, Iran is interested in Bolivia's largely untapped uranium deposits. Iran also is interested in uranium deposits in Brazil and Venezuela, the other two stops on Ahmadinejad's Latin America trip. Iran has promised Bolivia it will supply the technology to build a TV station to serve indigenous people in the nation's Chapere region, the major cocaine-producing region of the country from which the DEA was evicted last year. Observers say they don't see Ahmadinejad's brief visit playing into domestic politics in Bolivia, where Morales is favored to win re-election in December 6 elections. "The people who are angry at this are going to vote against him anyway," Aparicio said. Ahmadinejad's visit to Brazil a day earlier had a different dynamic, mostly because Brazil is quickly becoming a major player among the world's non-aligned nations. The largest country in South America is hosting the 2014 World Cup soccer championship and was awarded the 2016 Summer Olympic Games last month. Brazil also will become a non-permanent member of the United Nations Security Council in January, and President Lula has been lobbying for a permanent seat. Lula was criticized by some analysts for hosting Ahmadinejad this week in the first visit by an Iranian head of state to Brazil. "It's a mistake," said Bernard Aronson, the U.S. assistant secretary of state for inter-American affairs from 1989 to 1993. "They think it shows their independence but it actually shows their political immaturity. It doesn't help Brazil's image around the world." But Brazilian journalist Jaime Spitzcovsky says he understands Lula's motives. "Lula wants to play an important role in the international arena as a mediator," Spitzcovsky said. "He understands that Brazil can play a more important role in different parts of the world. He wants Brazil to have a higher profile in the international arena." Lula has taken a particular interest in the Middle East. In the days before Ahmadinejad's visit, Lula hosted Israeli President Shimon Peres and Palestinian Authority President Mahmoud Abbas. He even suggested Monday holding a soccer game with Brazilians playing against a joint Israeli-Palestinian team as way to show that all sides can get along. Lula's international interests are also an extension of his domestic profile as a person who can deal with all parts of Brazilian society, Spitzcovsky said. "He wants to be perceived as someone who can dialog with everyone around the world," Spitzcovsky said. "In Brazil, he can talks to groups on the left in the morning and bankers in the evening. He is a negotiator."